Husqvarna is the brand that comes to mind when you think about robotic mower for your acre lawn. It has a reputation for quality home improvement tools. Husqvarna 450X is the latest of the automatic lawn mower models with the others being 430X, 105 and 315. It has far better features than many other models. The only other models that come close to it are Ambrogio L300 and Honda Miimo 510. 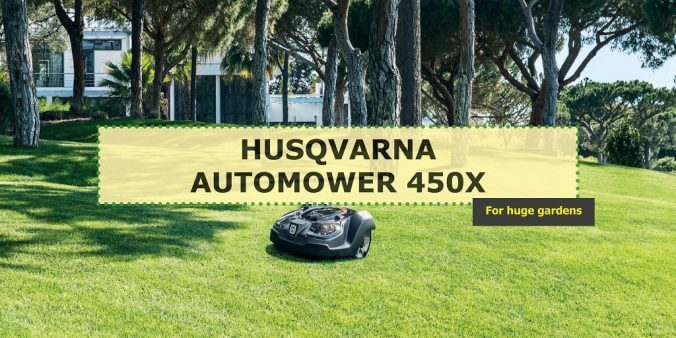 Although Husqvarna 450X does not use solar power, the outward structure of the automatic electric robomower closely resembles Husqvarna Automower® Solar Hybrid which is a solar powered lawn mower. The solar hybrid autonomous lawn mower has an integrated solar panel on its top plate and a solar cell for use during the sunny weather. However, still charges with electricity when solar power is unavailable. There are several makes of the solar lawn mower robot machines in the market. While having lower power consumption, they do not mow a large area as the 450X. We expect that the future models will also be solar hybrid models with higher capabilities. Let’s see what 450X offers in this lawn mower review. Husqvarna Automower 450x can handle a lawn of up to 1.25 acres (about 5,000 m²). This automatic lawn mower almost reaches the capabilities of bigger robotic mowers used in large fields. The battery reaches a full charge in only 75 minutes. At a full charge, the auto lawn mower can work tirelessly for 260 minutes. It is the highest mowing time among the automatic mowers of its class. This mower also has very low noise levels at 58dB. It is also light in weight weighing at about 13.9kg. 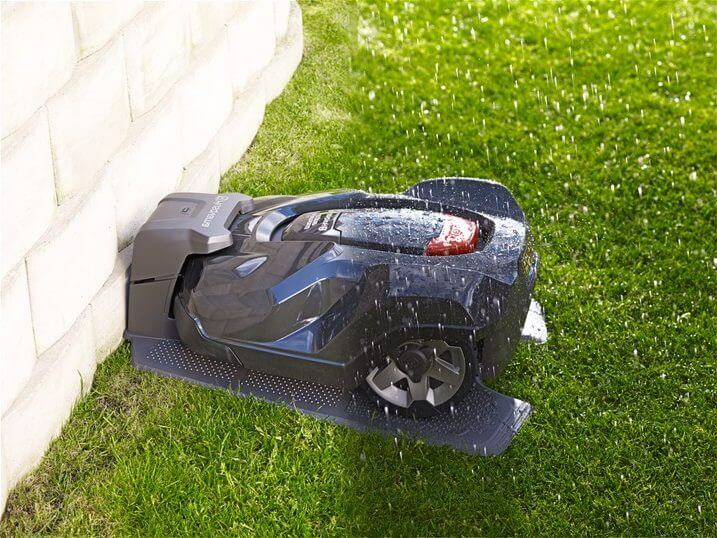 Husqvarna Automower 450x is perfect for 5,000 m² lawn. Husqvarna 450X comes with a mobile app which makes easy to control it across the lawn. The app is available for iOS and Android. By the use of the app, you can schedule the robomow in a certain area. You can also go through the mowing history. When used with GPS technology, you can view the exact location of the automatic lawn mower or areas passed a while ago. The app also comes handy when identifying areas that lawn mower will reach with or with no perimeter wire. The app comes with all the controls and features found in the auto lawn mower including the ‘weather timer’. This feature helps determine how often the grass needs to be cut and the optimum height for cutting the grass. It uses the weather data to determine the growth rate of the grass. It will mow more often during the rainy season than it would do during the dry season. No human intervention is needed in all these intelligent decisions. This feature optimizes the frequency and times for cutting grass. In the process, it ensures that energy is saved, reduces wear and tear of the blades and keeps the lawn looking great all year round. Here is a video of how to use the app. The built GPS module helps locate the exact location that the robotic mower is. However, you should mark the mower’s work area with a perimeter wire. The perimeter wire acts as a physical barrier where the mower does not cross. The wire is either secured in the grass using a hook or buried underground about 5 to 10cm deep. Burying the wire is recommended as it prevents the risk of the wire being cut by the mower or someone stumbling on it. In fact, a buried wire works as if you are working without a perimeter wire. The lawn mower with GPS enables geo-fencing feature where I can use the robot lawn mower without perimeter wire. GPS is very accurate at boundaries. However, the manufacturer does not recommend using the lawn mower without perimeter wire. 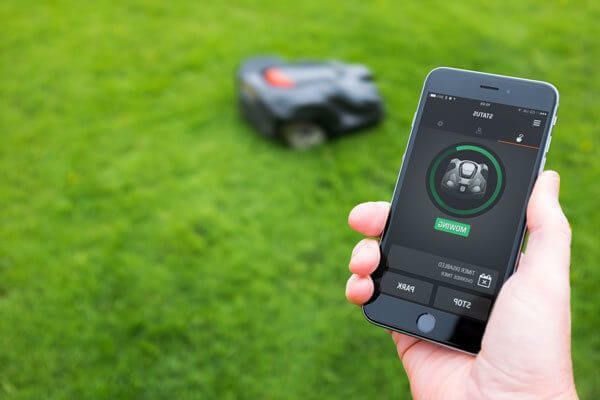 The autonomous lawn mower connects to the internet by the use of a 3G/4G connection. It has a GSM module and SIM card slot for the purpose. 3G internet connection is an ideal way of connecting to the internet given the large area that the auto lawn mower covers. It is highly unlikely that the conventional home Wi-Fi can cover an area as large as 5000 m². The package does not come with the SIM card. Fortunately, the automower is unlikely to use more than 50 MB a month. 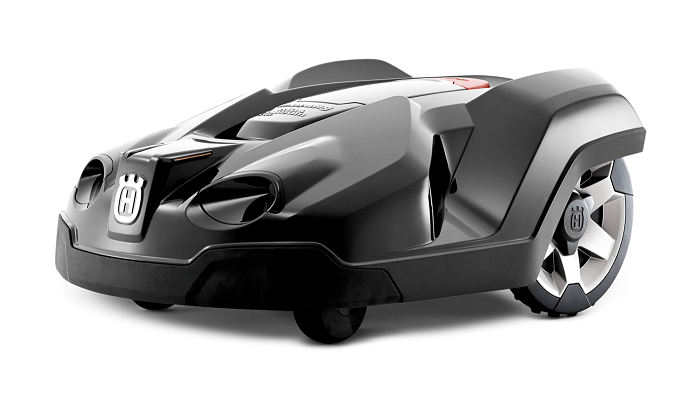 Husqvarna 450X is a weatherproof autonomous lawn mower. However, just like any other appliance, it is not a good idea to mow during the extreme wet weather. Cutting the grass during the rainy weather is likely to damage the lawn especially if the grass is young. Moreover, the mower collects lots of dirt and requires extensive cleaning after working. It will work when it is raining hard or in the blazing heat keeping the schedule. Here is a table comparing Husqvarna 450x with other competing consumer models as well as Husqvarna 430X. There might be tree stumps, rocks and other structures in the lawn. 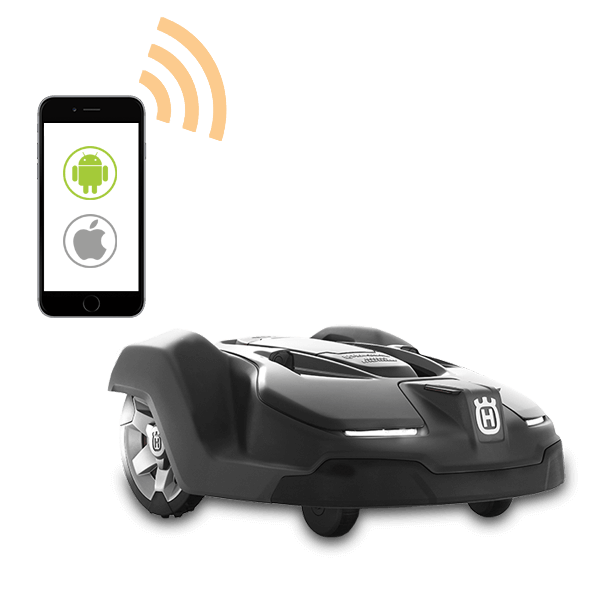 The robot lawn mower with ultrasound collision sensors ensures that the mower does not run into anything by force. Therefore, it does not hurt pets or children. You might see it nudging an obstacle but then backs off and finds its way around it. If the auto lawn mower is lifted suddenly, the cutting blades stop working. The same happens when the mower falls over. Therefore, the blades do not injure anyone in the course of its work. The robot mower has several impressive anti-theft features too. You can track the whereabouts of the mower using GPS module and its companion module. Moreover, there is a PIN security code that has to be activated when the robot leaves its work area. In case, it is picked when working; it activates an alarm system to on its app and the machine itself. The charging station is specific to my mower and cannot work with any other. Therefore the mower becomes useless if stolen. The Husqvarna’s proprietary weather timer feature takes care of your lawn on autopilot. The GPS capability enables you to pinpoint the mower’s location at all times and lets you know where the mower has passed. Husqvarna robotic lawn mower 450X is ideal for large lawns. It has a high motor cut current to sustain it over four hours, works automatically and requires little maintenance. You do not have to think about mowing anymore. The automatic lawn mower decides when to mow and does it on its own. It is a combination of convenience and quality performance for that perfect robotlawn. Here is a video link that explains how the automated lawn mower works.